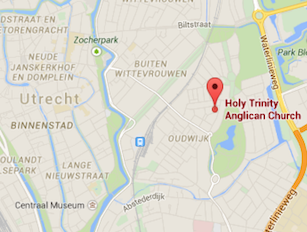 This week has been a horror as the violence we hear of so often in the news in other places has come close to home here in Utrecht. We pray for the families suddenly torn apart unexpectedly by loss and grief and for those struggling to recover wounds to their bodies and to their souls. Events like this, especially when they are so close to home, can remind us: of the frailty of life; of the depths of confusion and maliciousness that a human soul can get caught up in; and of the grace that pervades our society so that it happens so rarely in our midst. I hope we don’t see ourselves too differently from the sad man, created in the image and likeness of God, who has caused such devastation, who has fallen so disastrously. Being delivered from a demon. Our walk through Lent, and especially in the first three weeks, are a confrontation with evil – first Jesus himself was tempted in the wilderness by Satan, then last week, a mother was pleading with Jesus for relief for her daughter who is grievously vexed by a demon, and this morning, Jesus is casting out a demon [St Luke 11:14-26]. How do we understand this deliverance from a demon? To speak of demons is to speak about ways in which the soul is bound by a destructive force. I think it is not uncommon for people to come into the Church or to come back to the Church in their lives, when they are confronted by a malevolence that they see in their own soul – something within them that frightens them, something which they seem to have no control over, that is controlling them. Perhaps it was a clear personal moral failure that they could no longer excuse or explain away. Or perhaps the malevolence that they saw was in another person close to them that shocked, frightened and woke them up. The seeing of that evil, is a moment of grace, because it requires spiritual light, to see, to recognize it as evil. Before that we are living in a dream. It is a certain maturing, a waking up, to the nature of reality and to the nature of the fallenness of the human soul and of a demonic realm. It is a waking up that can terrify us and move us seek God more wholeheartedly. That is what it is to be delivered from a demon. If that has happened to you, you know it as a great moment in your life. It is to experience being lifted out of darkness and into the light. But Jesus warns us this morning that this initial experience of delivery, and being woken up, is not the end of our experience of trial and of temptation. That we are to be wary for the rest of our lives that we fall not again or in some other way even more dramatically. In the early Church, the doctors of the soul looked at all the possible demons or destructive spirits that can come into our house, that is, our soul, and dwell there. They gathered them up from the warnings of Jesus and the Apostles under seven or eight headings, in part related to this saying of Jesus – seven other spirits more evil than itself. You have probably heard of the Seven deadly sins – pride, envy, wrath, sloth, greed, gluttony, and lust – or maybe some variation of these. An earlier list of 8 principle vices from the 5th century was – pride, vainglory, dejection, wrath, sloth, greed, gluttony, and lust. The students are currently looking at these principle vices in their Bible studies. It is to look at the breadth of the temptations of the soul. It is early Christian psychology. 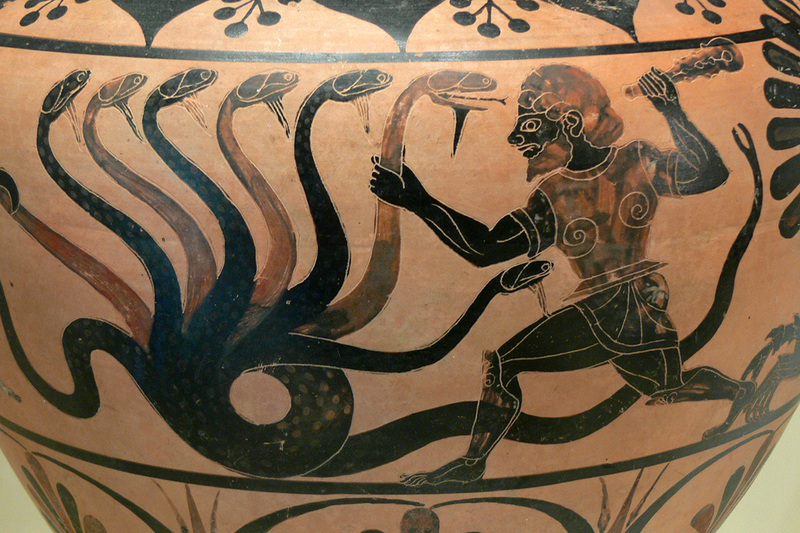 The Greeks had a myth about the Hydra – which was a monster with several serpent like heads. The problem with trying to slay that monster, was that if you cut off one head, two more would grow in its place. A frightening prospect. But it is something like what Jesus is warning us about today is the nature of our spiritual life. The students are looking at these “serpents”, the eight deadly sins, squarely in the face! But how might our awareness of spiritual dangers help us, and how does it not help us? First, how does it not help us to study these principle vices? This would be a wrong way of understanding how we grow in holiness: if we think that once I conquer one by practicing a spiritual discipline and a virtue that is its opposite, then I will look to the next one that appears, and conquer it through practicing a spiritual discipline and an opposing virtue, then I move on until I have conquered them all! Chop off one by one the heads of the hydra at a time. But our growth in holiness, our overcoming temptation, doesn’t work like that. How could it be helpful to us to study these principle vices, these seven demons worse than the first? The purpose in looking at the principal vices is the same purpose that a Christian has in considering the Ten Commandments. We don’t use the knowledge of them as a kind of plan of eradicating sin from our souls one sin at a time, but rather, as part of a plan of self-reflection to see if we are truly following Jesus. The early Church psychologists [e.g. Evagrius, Cassian, Gregory the Great] saw a kind of priority of one demon over all the others – they saw from their reflections on Scripture and observation of their own souls that the origin of seven of them is pride. So if all of the other demons are a result of pride, then when any vice manifests itself in our soul, the call is to humble ourselves before God, ask forgiveness, and stay closer to Christ. If you think of the Hydra with its several heads, rather than trying to strike at the heads, you strike at the body, pride, which is the source of them all. That’s not how Hercules overcame the Hydra, but the Greeks are not our example here, it is not superhuman strength that is our model. It is Christ who is our example, and he is the stronger one, who has overcome the Prince of pride – satan. Jesus says, When a strong man [satan], fully armed, guards his own palace, his goods are safe; but when one stronger than he [Jesus] attacks him and overcomes him, he takes away his armour in which he trusted and divides his spoil. [St Luke 11:21-22] Jesus overcame the pride of satan, the armour in which he trusts, not by superhuman strength but by humbling himself, even to death on the Cross – and so Jesus has been exalted by the Father beyond everything on earth and in heaven [Philippians 2:1-11]. The outward manifestation of any kind of sin itself in us, can be redemptive, if we are observing ourselves, if we recognize that it reveals in that moment our more hidden pride, that we are walking away from God inwardly. It is a sign that we need to draw closer again – humble ourselves, to stay closer to Christ – strike the beast not in the heads, the secondary manifestation, but in the heart. The Christian Way is an ever-deepening humility, ever-deepening repentance, ever-deepening trust in the mercy, and growing gratitude that we are sheltered under that mercy. We look then at all others around us who are falling, with the eyes of mercy, not of condemnation. 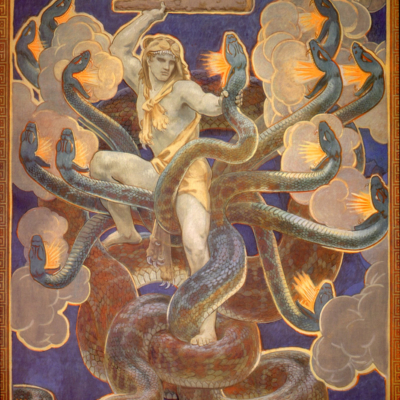 And as we do this, a continual lifetime of turning to Jesus and staying close, the Hydra, the many headed serpent still appears, but we are bitten less and less, and virtue naturally, or rather, supernaturally, appears in its place by grace. We don’t call the appearance of these virtues in the soul our work or the work of the Spirit, but the fruit of the Spirit. These fruit come of themselves, they are not forced. They grow out of our union with Christ. I am the vine you are the branches. [St John 15:1-8] And those branches will bear fragrant blossoms and abundant fruit when united closely with the Vine. In the light of Christ, do you see that you have been bitten by a serpent or that you are entangled by one? Let us humble ourselves before him now. Jesus gives us opportunity for repentance. Before coming for Holy Communion, let us examine ourselves and be completely honest about our failings and then, trembling, and with faith, hope and love, let us come forward to be delivered from evil and more deeply united to Christ and so become a more fragrant offering and sacrifice to God.